SPRING IS IN THE AIR—IS YOUR PATIO READY? Brock Doors & Windows Ltd. SPRING IS IN THE AIR—IS YOUR PATIO READY? I’m not sure I have ever been more ready for the summer to get here. I say this every Springtime, though… Here in Toronto, surely, you can empathize. We experience long winters and by the time the first somewhat-warm day hits us, I’m ready for flip-flops, shorts, swimming pools, and afternoon barbeques on the patio with my family. But, this year, I am especially ready for a few upgrades to my patio. My family has recently grown by one; my husband and I welcomed—finally—our first girl into our little clan. We have three boys (I had started to think I was only ever going to be a boy-mom…)! I’ve been bugging my husband for a couple years about our patio. You see, I want a bigger patio door and wider patio space to fit our needs-to-be-built picnic table. It’s a tall order, I know. But, our agreement was that we would do these upgrades if and when our family got any bigger. Well, I won; our family got bigger. I got my sweet little girl and now we get to expand our patio, so we can make even better memories in our backyard. Naturally, we’ve enlisted the help of our favourite installation pros in Brampton, ON: Brock Doors and Windows. They helped us remodel our home years ago when we purchased this house. We replaced the windows, added a bay window to the kitchen, and upgraded our entry door. And, now, we get to have them make room for a bigger, better patio door to go with our pending, soon-to-be modernized patio! We’ve picked out everything we need, now my husband just needs to get to work building our 6-person picnic table! 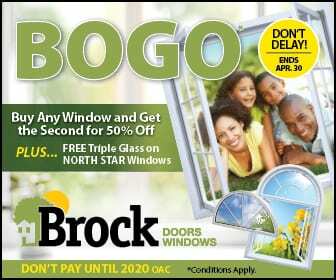 I’m looking forward to next weekend when our trusted Brock Doors and Windows professionals arrive to expand our patio door in Brampton! If you want an improved patio door, too, give them a ring!